It should be of no surprise to you to understand that the act of making caloric counting the cornerstone of weight loss has failed to produce a thinner, leaner and lighter nation. In fact just the opposite, the rates of obesity in the UK and elsewhere are climbing, younger and younger people are becoming morbidly obese with all of the associated health risks being identified in children as young as 5 or 6. The Overseas Development Institute in 2014 said one in three people worldwide was now overweight and urged governments to do more to influence diets. In the UK, 64% of adults are classed as being overweight or obese. Globally, the percentage of adults who were overweight or obese – classed as having a body mass index greater than 25 – grew from 23% to 34% between 1980 and 2008. The effects are not simply related to developed countries either, developing countries continue to experience similar consequences of changes in eating habits. A landmark paper published in the Journal of the American Medical Association by David Ludwig and Mark Epstein revolutionised the way we should think about the influence our genes have on our health. This was written in a more media friendly manner and published by the New York Times. It makes compelling reading to help understand the cause of obesity. It’s not that Isaac Newton and his first law of thermodynamics was wrong. It’s right—energy is conserved in a system. This is the whole foundation of our calories in/calories out, energy balance concept of weight loss. Just eat less and exercise more, and all the pounds will melt off (not universally succesful as we all know). But there is one fatal flaw in that thinking. The law states that energy is conserved in a “system.” It is true that, in a vacuum, all calories are the same. A thousand calories of cake and a thousand calories of broccoli burned in a laboratory will release the same amount of energy. But all bets are off when you eat the cake or the broccoli. These foods have to be processed by your metabolism, including the microbiome (not a closed system). Cake and broccoli trigger very different biochemical responses in the body—different hormones, neurotransmitters and immune messengers are released with very different outcomes. The cake will spike your blood sugar and insulin and disrupt neurotransmitters, leading to increased hunger (and associated cravings) and fat storage, while the thousand calories of broccoli will balance blood sugar and make you feel full faster and for longer, cut your appetite and increase fat burning. Dr. Ludwig, for the first time, explains why. It’s not overeating that makes you fat. It’s being fat that makes you overeat. Once you start to consume refined carbohydrates, such as bread, rice, potatoes, pasta and any form of sugar, you start making a certain kind of fat cells called VAT or visceral adipose tissue. This and many other factors mean that simply limiting calories without changing food selection will never result in healthy weight management or body composition. 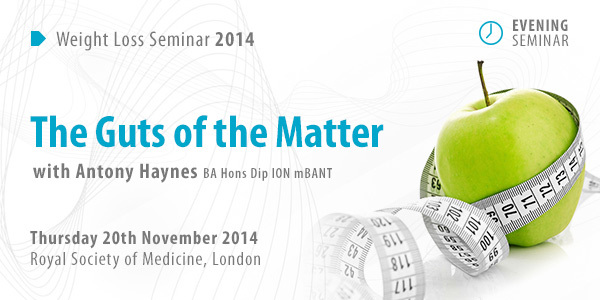 This evening seminar led by the very experienced nutritional therapist Antony Haynes BA, Dip ION BANT will focus on the hypothesis that obesity is a dietary composition issue, and not a calorie driven issue. The aim will be to reinforce your current knowledge, open up new and improved lifestyle modification straegies and assist in the development of a sustainable science based approach to food and weight associated mechanims. Calorie restriction fails to resolve obesity – Learn what do we do instead. Does being fat make you hungry or being hungry make you fat? Overeating doesn’t make you fat. Being fat makes you overeat! – Explore how to break the pattern. Most attempts to lose weight fail. – Understand why? There is a very real biological addiction of certain foods. Discover how to resolve this. In reality, changes in metabolic rate, fat storage, hunger depends on dietary composition. – Learn what we need to eat to change these? There is confusion about what fats do to or for our health, creating uncertainty about what is best to eat. – Comprehend correct fat selection in terms of what to eat. The human microbiome changes depending on food choice and certain foods to promote fat storage, and possibly even addiction. –Uncover mechanisms used by the microbiome to determine food selection and how to change them. Environmental toxins also act to promote fat storage and contribute to obesity. – Discover what toxins affect primary fat storage tissues and how to manage them. Genetics play a role, but epigenetics is more significant. Learn how to reduce anabolic drive &, leptin resistance. Uncover Ghrelin’s role in hunger. – Then discover how to make it work for the better. Implications for treatment and for policy – discuss best approaches to individualised care and possible public health policy ideas. Dr. Ludwig proposed a novel, radical but scientifically substantiated way to solve the obesity epidemic once and for all. In simple terms he says stpop worrying about how much you eat, because that is largely out of your control. Instead, focus on what you eat, the quality of the food you eat, the composition of the food you eat (high in the right type of fibre, quality protein and fat, low in starches and in particular simple refined sugar). Then, in principle you won’t be hungry and will shift from fat storage to fat burning. And you will prevent most chronic disease including heart disease, Type 2 diabetes, cancer and dementia. This model is a great foundation, adding additional support factors and you can really begin to change peoples lives faster and more efficiently for life.